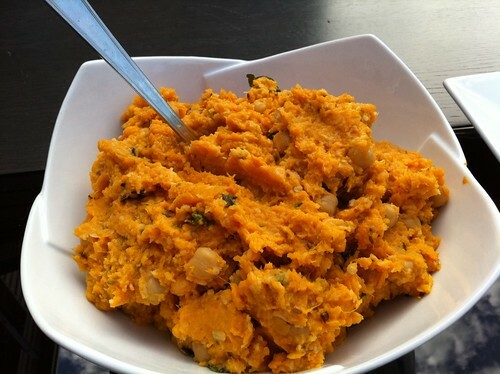 Sometimes you just need sweet potatoes. 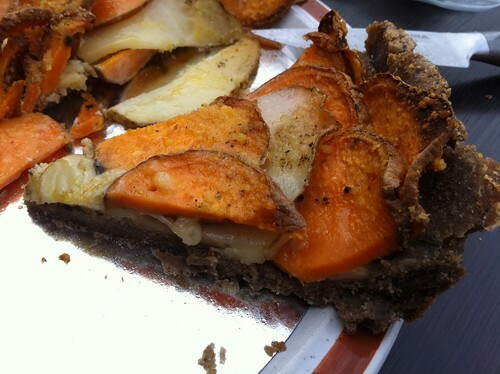 And to herald the season of root veggies, I’ve put them in a savoury tart. 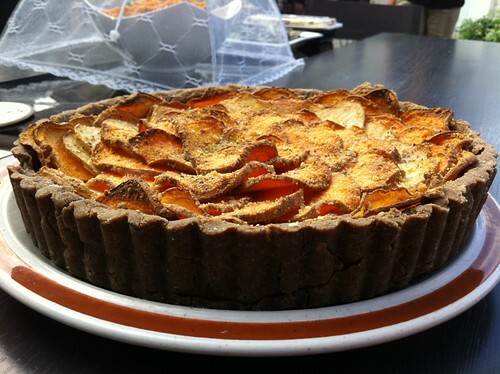 This is not just any tart, this one is gluten-free and absolutely divine. I took it to a barbecue with our friends Mike & Tanya, and we really enjoyed slices of this tart along with our last patio dinner. 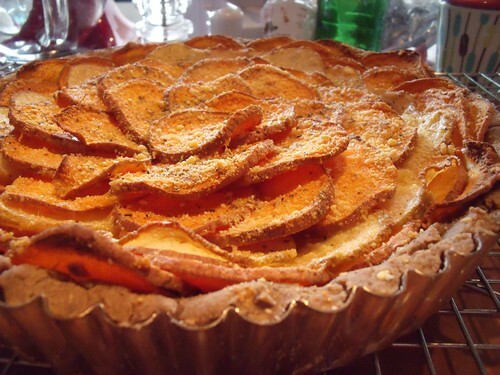 You can make it with all sweet potatoes, or a combination of regular and sweet potatoes. I love how pretty alternating the two look, but it would be delicious any way you decide to go! And glorious grilled greens. 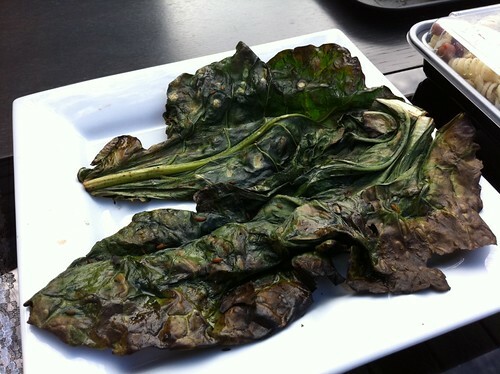 These were brussel sprout leaves from the garden, that Tanya did on the grill inspired by the Coconut & Lime Grilled Kale leaves we did earlier this summer. We loved this tart so much — the crust is super-filling, and we decided it could be glorious as a sweet dessert tart dough… without the herbs, and with a bit of maple syrup or brown sugar, mmmm. Preheat oven to 400F and grease your tart pan with olive oil. In a small bowl, combine flours, salt, za’atar, cayenne, olive oil, and water with a fork until the mixture becomes a ball of dough. Lightly cover your work surface with buckwheat flour, and roll out your dough in a circle to fit your tart pan. Place circle in tart pan and press dough into sides. Prick the inside of the pastry shell all over with a fork. 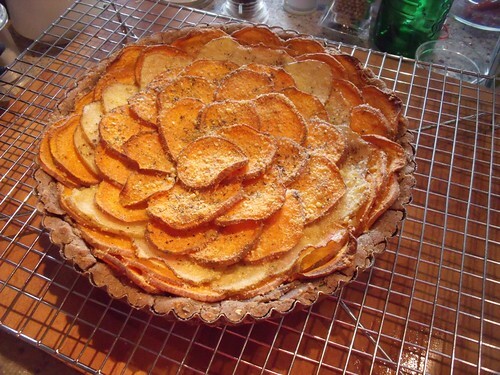 Spread mustard over the top, and sprinkle the swiss cheese and roasted garlic cloves over the bottom of the tart. In a bowl, toss potatoes, oil, salt, pepper, za’atar, and parmesan cheese. 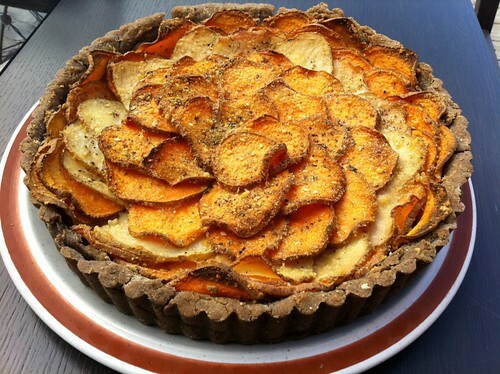 Make beautiful concentric circles with your potato and sweet potato slices, or toss them all in the middle of the tart. Brush the beaten egg over the crust. Bake at 400F for 45minutes. Remove to a cooling rack and let cool for 5-10 minutes before serving, and serve warm. Catie — so happy to have you back too! We will totally be in more healthy-delicious touch 🙂 Can’t wait to hear about all your new nutrition, food, life, fun ideas! If I wish to make mini tarts would I have to adjust the baking time? Jessica — when I’ve made mini tarts in the past, the baking time has always been less. I suggest setting a timer for 25 minutes, and seeing how they’re doing. My guess would be 30-40 minutes overall, but you’ll want to check on them frequently.